5 best wireless speakers - Awards 2014 | What Hi-Fi? First up, it's the Cambridge Audio Go at £120. The new, updated Go takes the crown from its now-discontinued predecessor - the excellent Minx Go (which won Product of the Year last year at £100). With plenty of new features added - including aptX Bluetooth, NFC pairing and USB charging on the go - and a smattering of design tweaks for a more polished look, the Go is an even more attractive proposition than before. Its compact, portable design and mighty 18 hours of battery life make it one of the most convenient portable speakers around. But it's the lively, full-bodied sound that sets Cambridge Audio apart from the mass of wireless speakers at this price. Considering how small the Go is, there's an admirably punchy, weighty bass underpinning the clear and surprisingly dynamic sound. It's a brilliantly packaged and fun-sounding speaker. Next on the list is a new entry: the Monitor Audio Airstream S200. There's little this slim, tall speaker can't do: aptX Bluetooth, AirPlay, DLNA, and Monitor Audio's own Airstream Direct method of instant wi-fi connection. That's an impressive amount of streaming features for just £200. The Monitor Audio faced stiff competition from the Samsung M5 (which offered similar features for similar money) but the S200 soared past with its powerful, spacious sound and subtler, more musical approach to songs. An excellent all-round performer for the price - it's no wonder it snagged an Award win. It's a short jump up the price scale for our next entry, but what a speaker it is. We saw the £330 Geneva Model S Wireless DAB+ occupy this category last year, and it holds on to its title for a second year in a row thanks to a winning combination of design and performance. The gorgeous detail, the subtlety conveyed in voices, and the wonderfully clear and rhythmic sound is unparalleled in this price range. The minimalist approach to design and features - it only has Bluetooth, a 3.5mm input and tuners - proves that you don't have to attempt every trick in the book to make a great wireless speaker. We also love the backlit touch controls, while the clock-radio feature is a bonus. A delightful, captivating speaker. If you've had reservations as to whether wireless speakers can ever truly be considered 'hi-fi', the next two Award-winners should put your mind at ease. The Dali Kubik Free embraces high-resolution audio, with its optical and USB inputs capable of playing 24-bit/96kHz files from a laptop. Its lively, upbeat performance doesn't discriminate against lower quality Spotify streams, either. The Kubik Free delivers a performance worthy of its £645 price tag - a mature, astonishingly detailed sound that handles authority and enthusiasm in equal measure. Voices sound intimate and nuanced with the Dali, and it's this subtle and expressive quality that gave Dali the edge over its closest rival, the £600 Sony SRS-X9. 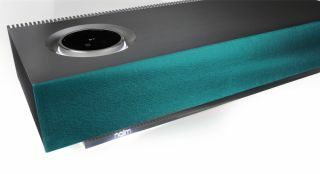 And finally, we come to our Product of the Year: the Naim Mu-so. It's the first time we've had a premium £750+ category for wireless speakers and, for £895, the Mu-so doesn't disappoint. Naim has taken its long-standing expertise and used it to great effect with a wireless speaker that comes as close to hi-fi as possible. It's a powerful performance. The spacious soundstage, stunning depth of detail, impressive low extension and huge sound is unlike anything we've heard from a wireless speaker before. Add in its extensive features (everything from UPnP, aptX Bluetooth and AirPlay to DLNA and internet radio) and a gorgeous aluminium design complete with a shiny, illuminated touchscreen volume dial, and you've got yourself an extremely accomplished and desirable product.